Flagship is a global enterprise shipping solution that helps large corporations to expedite the delivery process for high volumes of domestic parcels. In addition to domestic shipments, this multi-carrier shipping system tackles the complex problems that come with international shipments, such as multifaceted compliance and documentation requirements. Unlimited Locations – Flagship has been deployed to companies with thousands of users and hundreds of locations. Wave planning – The scalability, performance and flexibility of Flagship facilitate and streamline wave planning to ensure shipping options are tightly integrated into the process. Complex business processes – Flagship supports the most sophisticated business rules such as break bulk, advance rate shopping and multi-leg zone skipping. Logic Systems Engineering can bring together several important components of the supply chain into a single, seamless system, increasing efficiency and decreasing corporate costs. Enterprise Parcel LTL Shipping – the core module facilitating domestic and international origin shipping for parcel and LTL carriers. 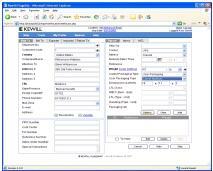 Export Documentation – a complete documentation production module that produces all standard export document sets. Export Compliance Screening – performs mandated regulatory compliance checks on your shipments, including screening for Restricted Parties, Embargoed Countries, and License Determination. BluJay Pack – a pick and pack module that allows businesses to pack cartons while verifying contents against customer orders. To satisfy the demands of your domestic and international customers, you want to feel confident that your shipments will be delivered on time with minimal interruptions. Flagship can help make this happen. Copyright © 2009-2019 Logic Systems Engineering. | All Rights Reserved.